Life after death is mentioned numerous times in the New Testament. But what about the Old Testament? Did believers before Jesus Christ speak about their hope for the future? 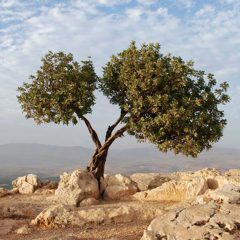 From our consideration of God’s promises to Abraham in the early chapters of Genesis, we have seen in Acts 7 and Hebrews 11 that Abraham didn’t expect to receive God’s promises in his lifetime, although he saw them from a distance, and eagerly looked forward to the city that God will build in the future. Abraham can only inherit these promises if he is brought back to life again, and lives ‘forever’. What about other Old Testament characters? Did any others express hope for a future existence? Some incredible promises were given to King David, which the angel Gabriel reiterated to Mary, telling her that they were primarily about Jesus Christ! (Luke 1:26-35) Yet, if you look carefully at the promises given to David in 2 Samuel 7, you will also read these words in verse 16, “And thine house and thy kingdom shall be established for ever before thee: thy throne shall be established for ever.” Surely this indicates David will see these promises fulfilled. Numerous chapters in Isaiah describe the paradise God has promised for this earth. Isaiah tells us so much about the ‘last days’, the time when flowers will bloom in the desert, the animals will cease killing one another – even a wolf will lie down peacefully with a lamb! He speaks of all nations going up to Jerusalem to worship the King and learn of God’s ways. If you long for an exciting vision of the future age, ponder these details in Isaiah 2:1-4; 9:6-7; chapter 11 and 35, 51:1-6; chapter 60; 65:17-25. God’s grand purpose that the whole earth will be filled with His glory was first revealed to Moses in Numbers 14:21. Will we all be given the promises at the same time?? To stir your vision of this exciting time we have listed some key Old Testament passages on Paradise in the Passages to Consider section. In our next blog we will consider the New Testament hope. Is the New Testament hope the same what was revealed to the Old Testament faithful? Or did Jesus offer something different for his followers? We will look in particular at what Jesus and his disciples preached, and the hope that the Apostle Paul openly proclaimed. What could be more exciting than the promises God has made to his followers? Especially when we’ve been invited to share!